Coral View Villas opened its doors for business in 1995 after the success of its sister hotel, Hidden Paradise Cottages. Picturesque bungalows are set within a sprawling tropical garden amongst hidden patches of fruit trees and vegetables, with the aim of supplying as much of our home grown produce to our kitchens and customers as possible. Situated in Lipah bay, Amed, Coral View Villas offers a hideaway holiday for families, couples and adventurers alike. 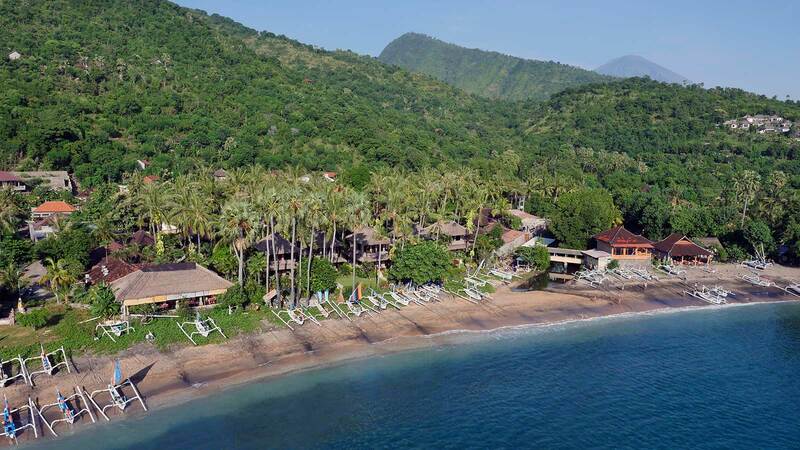 Beautiful coral gardens, an expansive black sand beach and rolling hills will keep you occupied; while the beachside restaurant, shaded pool and friendly local staff keep you blissful and relaxed. Browse photos from the garden and surrounds of Coral View Villas below, view the rooms we have available for your stay, or check rates and availability.